We recently completed the reinstallation of our permanent gallery at LACMA with materials from West Mexico, northern Mexico, and the southwestern United States (“American Southwest”). Many objects from the previous installation remain on view, chosen for both their outstanding artistic and cultural value, and for being being visitor (and curator) favorites! But we are delighted to be able to display some new objects and themes. The gallery’s previous iteration focused primarily on West Mexico (on objects from the states of Colima, Nayarit, and Jalisco) in order to highlight the outstanding Proctor Stafford collection. For the new installation, we expanded the gallery’s scope to also incorporate northern Mexico and the American Southwest, with objects from Casas Grandes (Paquimé), the Mimbres Valley, and the Ancestral Pueblos. The richness and diversity presented by the objects in these regions is complemented by a focus on shared practices, such as the Mesoamerican ballgame, which was played by societies from Honduras to Arizona; shared motifs like the step-fret; shared entities such as supernatural serpents (feathered or horned); and the exchange of goods including turquoise and feathers. We made it a priority to draw connections between ancient Mexico and the American Southwest in order to urge visitors to question modern borders in their understanding of the ancient past. We were able to achieve this objective thanks to the generous object loans by the UCLA Fowler Museum, which are displayed alongside LACMA pieces. Sharing works between the two museums proved to be a great idea and allowed us to enrich and diversify displays without needing to acquire new objects. The new gallery also includes two vessels from circa 1900 from the Acoma Pueblo, New Mexico, displayed alongside Mimbres, Casas Grandes (Paquimé), and Hohokam works. Our goal was to recognize the continuing traditions of indigenous artists of the Americas across the ages, and we are pleased that these newer vessels, set on a large pedestal that is centered on one of the gallery entrances, are a major visual focal point for the whole gallery. It is our hope that these connections make the pre-Columbian past more present and relevant to our visitors and we look forward to seeing how they respond. In several ways our galleries acknowledge a connection to post-Conquest Latin America. First is the basic layout, on the same floor as “Latin American Art” and arranged parallel to those galleries. Indeed, upon leaving the West Mexico gallery, one steps immediately into colonial period Mexico. Second are the connections between specific objects in these galleries, for the Volador ceremony in the 17th-century Mexican biombo painting (M.2005.54) recalls the ancient Nayarit Pole Ceremony model (M.86.296.35), and examples of 20th-century Mexican silver jewelry actively evoke ancient calendar signs and other motifs. Third is the design of the Ancient Americas galleries themselves, completed in 2008 by Jorge Pardo, an artist who was born in Cuba but resides in Los Angeles and Mexico. By selecting a Latin American artist to design this space, LACMA chose to make a connection to contemporary Latin America. But with our new installation in the Pardo-designed gallery, we also want to celebrate the long tradition of indigenous artists of the Americas, both past and present. The Pardo design was, of course, always on our minds as we worked on the new installation, because we had to work within the design and submit any changes—including changing some of the colors in the green palette—for approval by Pardo’s studio. But also on our mind was Dr. Virginia (Ginny) Fields, curator at LACMA for 22 years until her untimely death in 2011. Ginny worked with Pardo on the original installation in 2008; the West Mexico gallery was the last one to be reinstalled, and thus it still bore Ginny’s indelible mark. We found ourselves thinking about her often during the process of deinstallation and reinstallation, and during this process, exhibition designer Victoria Behner rediscovered a binder of photographs from the original gallery install, including a picture of Ginny placing an object in a mock-up case. Because all the cases, pedestals, and build-ups were customized by Pardo’s studio, all the details had to be mapped out in advance. Victoria explained to us that she, Ginny, and other colleagues spent months “in the basement” working on these mock-up cases. Of course the straight lines of the mock-up cases and build-ups would be transformed into the undulating forms of the Pardo installation that we know today. Working as curators in the Art of the Ancient Americas at LACMA, we find ourselves often in contact with Virginia’s memory and continued presence, whether through the collections she built, the legacy of the exhibitions she organized, or her handwritten notes about objects in our files. As we re-inaugurate our West Mexico gallery, we want to acknowledge and thank Virginia for her years of work, which allows us to display extraordinary objects and teach our public through these works and the artists who made them. 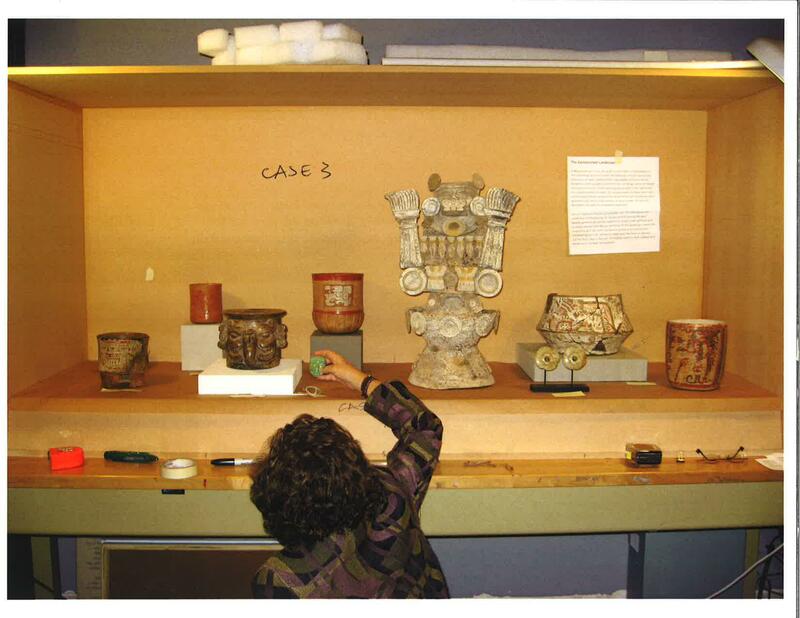 Dr. Megan E. O’Neil is Associate Curator in the Art of the Ancient Americas at LACMA. Her first book,Engaging Ancient Maya Sculpture at Piedras Negras, Guatemala (University of Oklahoma Press 2012), examines how the ancient Maya used sculptures to make contact with the past and how sculptures inspired reception and performance. She also has published on these topics in Res, Ancient Mesoamerica, and the Journal of Visual Culture, and in Striking Images, Iconoclasms Past and Present. Before LACMA, she taught at several universities and worked on curatorial and education projects at the intersections of universities and museums. She also recently published a revised edition of Maya Art and Architecture, co-authored with Mary Miller (Thames and Hudson 2014). She is now curating an exhibition of Maya ceramic vessels, scheduled for May 2016 at LACMA.